Back in the spring of this year several people began discussing the desire to purchase one of Surfer’s foals from this his last crop as a “buy back” foal. We knew that several factors would cause the price of these foals to go very high. But why not join together with others who had the same dream to make the wishes come true. Hundreds of people joined their small and large contributions together and won the bid on this lovely filly. Her price set a new auction record at $25,000. She is one of Surfer Dude’s last foals. She has a wide blaze and blue eyes. What a beautiful addition she will be to the herd! 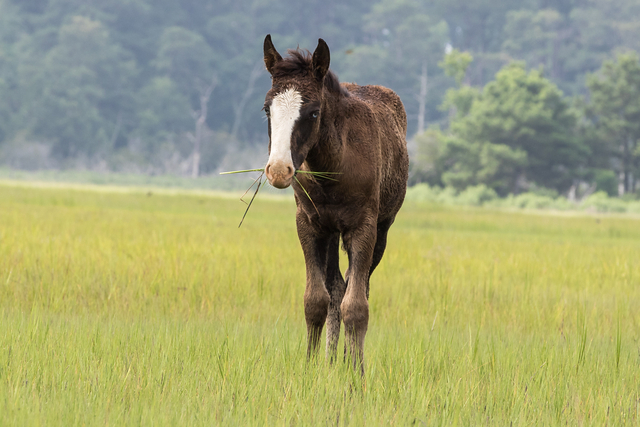 She will roam on Assateague, in the wildlife refuge, the rest of her days. Free. The crowd funded filly now needed a name. Many names were submitted, the top five chosen and lifted before the group for a vote. The members of the Chincoteague Legacy Group cast their votes and Surfer’s Filly was named CLG Surfer’s Blue Moon. But the magic of Pony Penning week goes on……. 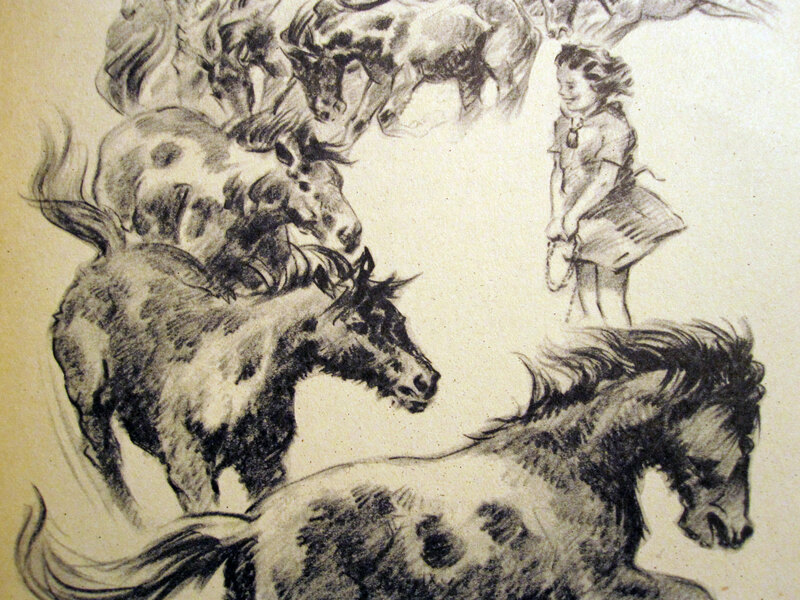 Due to the excitement that surrounds Pony Penning prices for some of the foals at auction have moved well passed the 1940’s prices in the book Misty of Chincoteague. Days when characters Paul and Maureen Bebee saved just over $100 in hopes of buying the Phantom are for the most part over. Many children struggle to save $500 to bid at the auction. That is where friends step in. The Feather Fund collects applications and each year and selects one or two children to assist in purchasing a foal at the auction. This year two girls were named Feather Fund recipients. I watched through tears as these girls reached their feathers high in the air and were able to keep bidding on the foals they had each chosen. Hugs, cheers and pony kisses followed. What a happy day! There was more to come as the magic of the day had not yet evaporated with the heat of the sun. A third young lady was present at the auction. She had come also with hopes of a Chincoteague foal. She rejoiced with the two girls and promised to submit her application again next year and perhaps be chosen. Sweet Abby had no idea that blessings were ahead. Shortly before the auction I learned that a couple from Canada had wanted to help the Feather Fund purchase a foal for a child. They learned of Abby and her determination and sweet spirit and set out to help make her dreams come true. Abby’s favorite foal came out and the couple continued the bid until the hammer fell. 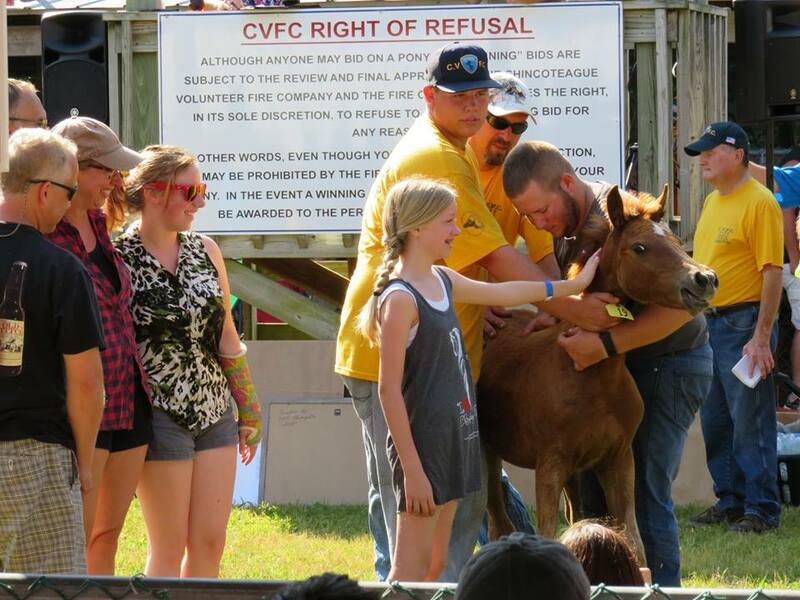 The auctioneer shouted, “SOLD” and the couple entered the ring to take a photo with the new foal. I could only imagine Abby’s heart as she was watching someone else purchase her foal. But wait… the couple wasn’t posing for a picture…. they were calling her to the center of the arena. The auctioneer’s voice must have been a blur as he unfolded the beautiful story and the loving couple presented Abby with her foal. Oh the cheers that lifted up. Somethings and places we build up in our heads from childhood story books. And they are never as wondrous if you ever are able to visit them in real life. Chincoteague is not one of those places. It does not disappoint. The sparkle of the week is still visible in the dust of the auction yard and in the hearts of young and old children alike. Oh Beth, I have happy tears streaming down my face. Wonderful story about the Feather Fund girls!